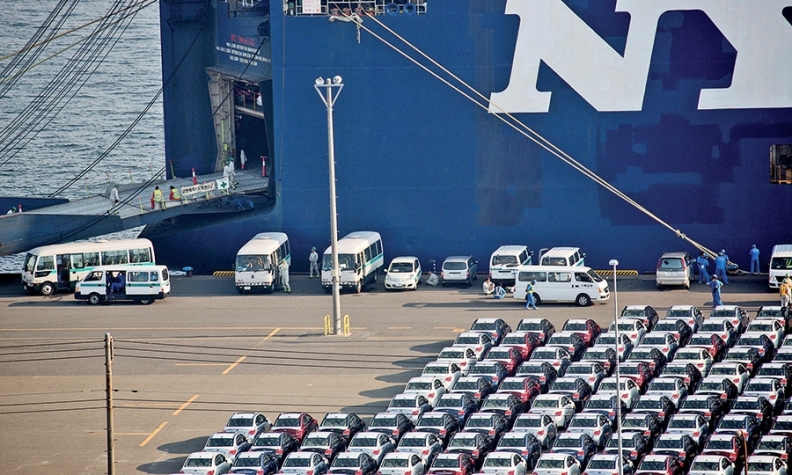 The Japanese government and central bank have sought to boost profits for exporters such as Toyota. TOKYO (Bloomberg) -- Japanese automakers may have run out of the fuel that’s driven profits higher for four years: the weaker yen. Toyota Motor Corp. and Japan’s six other automakers may combine to earn 4.55 trillion yen ($40 billion) in the fiscal year through March 2017, according to analysts estimates compiled by Bloomberg. That’s a 5.5 percent increase from what analysts are projecting for the period ending next month, and would be the slowest pace of growth in five years. These estimates may still be too optimistic. Changes in foreign exchange rates reduced operating income at Nissan Motor Co., Honda Motor Co. and Mazda Motor Corp. in the three months through December and provided the smallest boost to Toyota’s quarterly profit in more than three years. With the yen soaring last week to the strongest level since October 2014, earnings may fall next fiscal year, according to analysts at TIW Inc. and Mitsubishi UFJ Morgan Stanley Securities Co.
“Japanese automakers won’t be able to achieve their growth targets if we take the current spot rate of the yen,” Koichi Sugimoto, a Tokyo-based analyst at Mitsubishi UFJ Morgan Stanley, said by phone. “Profit will decline against previous years,” dropping by more than 10 percent for some companies, he estimates. Driving down the value of the yen has been the cornerstone of policy under Prime Minister Shinzo Abe and his hand-picked Bank of Japan Governor Haruhiko Kuroda. The government and central bank have sought to boost profits for exporters such as Toyota, betting the companies would then be able to raise prices, boost wages and stoke inflation. Even after the Bank of Japan adopted a negative interest rate policy last month, investors sought refuge from a global stock-market rout in haven currencies including the yen, exacerbating gains that Kuroda had been trying to discourage. Concern is growing that the stronger yen will erode the competitiveness of Japanese exports and cut the value of profits brought home from overseas operations. A weaker outlook for earnings would also risk undermining the country’s annual wage negotiations. Japanese labor groups this week plan to tamp down their requests for wage increases, with Toyota’s union asking for 3,000 yen raises in base monthly salary, half as much as it requested last year. Exchange rate changes reduced operating income by a combined 61.9 billion yen for Nissan, Honda and Mazda in the quarter through December. At Toyota, currency swings boosted profit by 5 billion yen, the smallest amount in 13 quarters. This contributed to the world’s largest carmaker posting its first decline in quarterly operating profit in almost two years. Last quarter’s results show some Japanese automakers began facing headwinds even before the yen strengthened to 110.99 against the dollar last week. The currency has gained against all its 31 major peers this month. In today's trading, the yen was slightly weaker, at 114.25 yen to the dollar. Honda missed analysts’ estimates for net income, operating profit and revenue, and cut its fiscal year sales forecast by 50 billion yen. Honda Executive Vice President Tetsuo Iwamura declined to comment on “violent fluctuations” in the value of the yen during a Jan. 29 press conference. Mitsubishi Motors Corp. also reduced its full-year sales forecast by 20 billion yen, while Suzuki Motor Corp. trimmed its profit target by 5 billion yen. Mitsubishi Motors attributed the change to “the current global economic situation and market trends,” while Suzuki cited the reversal of deferred tax assets. Spokesman for Subaru maker Fuji Heavy Industries Ltd., Nissan, Honda and Mazda declined to comment on the impact foreign exchange changes may have on results through the next fiscal year. Representatives for Toyota, Mitsubishi Motors and Suzuki didn’t immediately respond to e-mails. Toyota leads the pack among automakers most affected by the yen weakening. Every one-yen appreciation against the dollar reduces the company’s profit by about 40 billion yen, TIW’s Takada said. “How can they make up for that? So far, they are solid in North America and China, but as the global economy loses traction, you can’t expect strong growth in volumes there,” he said. In the U.S. sales rose 5.7 percent last year to 17.5 million. Analysts and executives entered 2016 expecting slower growth, and deliveries slipped 0.3 percent in January. Toyota and Nissan each increased incentive spending by more than 15 percent for the month, according to researcher Autodata Corp.